A-HOTEL.com - Luxury and cheap accommodation in Russkaya Mamayka, Russia. Prices and hotel, apartment booking in Russkaya Mamayka and surrounding. This indicative offer was derived from the most recently booked accommodation in Russkaya Mamayka and sort by the price, from cheapest Russkaya Mamayka accommodation to the most expensive hotels. To select accommodation by your preferences we recommend to choose from 1 accommodation offers in Russkaya Mamayka in total. By entering the dates of your overnight stay in Russkaya Mamayka and using the filter tools you can sort the best possible accommodation for you. The entered dates of your stay are crucial for the most accurate offer as it derives all the online information on pricing and availability of Russkaya Mamayka accommodation. Then you can book the selected Russkaya Mamayka lodging (hotels, apartments etc.) immediately. Tselinnaya 14/8 offers accommodation in Sochi, 7 km from Green Theatre and 7 km from Rivyera Park. This holiday home features air-conditioned accommodation with a terrace and free WiFi. "Апартаменты у Елены-1" is set in Sochi. This property offers access to a patio. Located in Sochi, 7 km from Green Theatre, Apartments u Eleny-2 offers a garden. All rooms feature a kitchen, a flat-screen TV with satellite channels, and a private bathroom. Apartment-studio on Timiriazeva in Sochi provides accommodation with free WiFi, 7 km from Green Theatre. This apartment features air-conditioned accommodation with a balcony. Apartments Vostochnaya 8/1 offers accommodation in Sochi, 6 km from Green Theatre and 7 km from Rivyera Park. It is situated 9 km from Sochi Winter Theatre and provides free WiFi. Located 6 km from Green Theatre and 6 km from Rivyera Park in Sochi, Apartments Ard House Sochi offers accommodation with a kitchenette. The air-conditioned accommodation is 8 km from Sochi Winter Theatre. Located in Sochi, 7 km from Green Theatre and 9 km from Rivyera Park, Apartment on Vinogradnaya offers free WiFi, free bikes and air conditioning. The apartment is 10 km from Sochi Winter Theatre. Studio Apartment on Vinogradnaya, a property with free bikes, is located in Sochi, 7 km from Green Theatre, 9 km from Rivyera Park, as well as 10 km from Sochi Winter Theatre. This apartment offers air-conditioned accommodation with free WiFi. Featuring free WiFi, Apartment Vinogradny Sad offers accommodation in Sochi. Rivyera Park is 5 km from the property. On Vinogradnaya Apartment offers accommodation in Sochi, 7 km from Green Theatre. The property, housed in a building dating from 2014, has free WiFi and is 9 km from Rivyera Park and 10 km from Sochi Winter Theatre. Located in Sochi, just 6 km from Green Theatre, Apartment on Vostochnaya offers accommodation with barbecue facilities and free WiFi. The property has sea and city views, plus is 7 km from Rivyera Park. Situated in Sochi, within 7 km of Green Theatre, улица Волжская, 16 offers accommodation with air conditioning. The property has mountain views and is 8 km from Rivyera Park and 10 km from Sochi Winter Theatre. 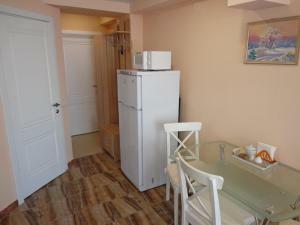 Квартира enjoys a location in Sochi, just 7 km from Green Theatre and 8 km from Rivyera Park. Featuring city views, this apartment also comes with free WiFi. Margarita Guest House is located in Sochi, a 15-minute walk from the Black Sea coast. Free WiFi access is available. Nice Hostel Sochi is situated in Sochi, 5 km from Rivyera Park. Free private parking is available.